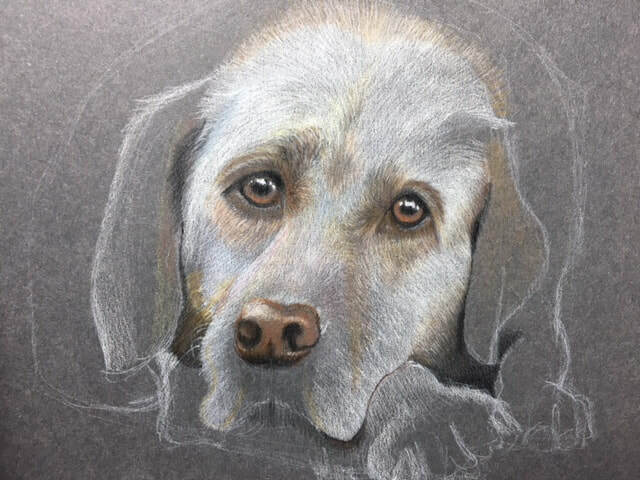 ​I love this drawing of this sweet Basset Hound. When trying to capture animals, I strive for a softness that relates to how it must feel to touch their velvety fur. 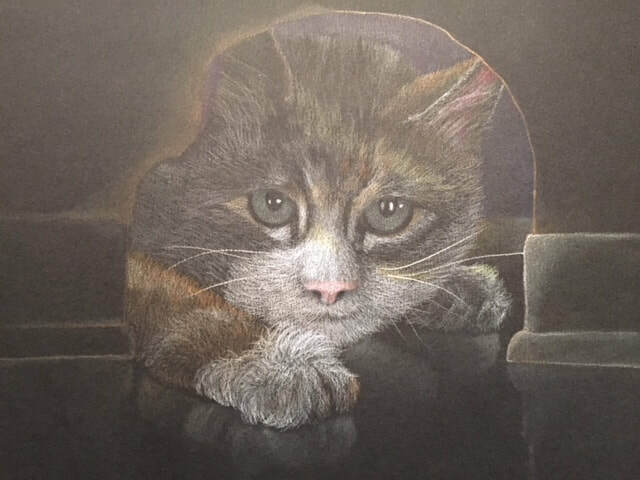 This custom artwork was created on Archival Gray Paper and executed in the highest quality Colored Pencils from Germany. The size is 11" x 17". 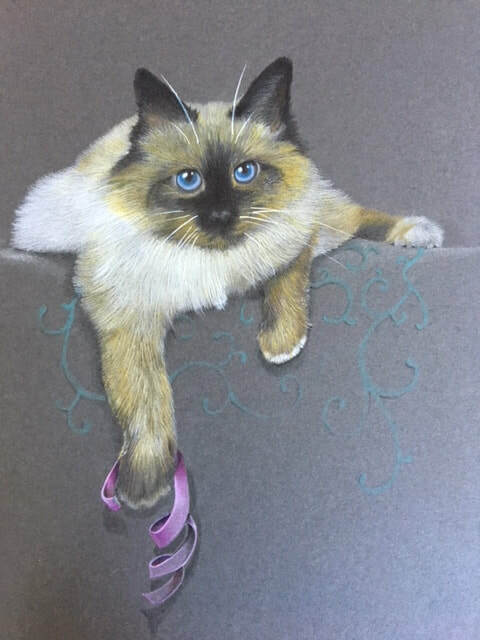 It appears this Siamese Cat has had an encounter with a violet ribbon that at one time adorned a gift. Looking at us and, I imagine, she is wondering just what is the problem. This is another example of the softness I try to achieve in my intricate work... as if you could touch the drawing and feel this delicate creature. 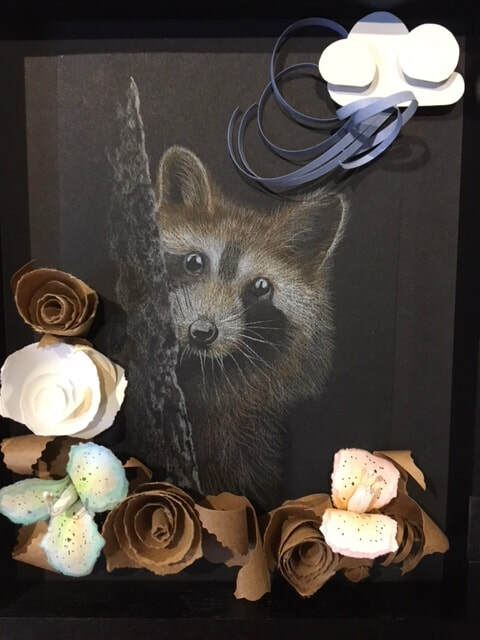 A drawing of a 'Woodland' creature was my endeavor for this very special gift that was given to a friend for her Baby Shower. She is having a little boy with the theme of his room done in nature elements. The final artwork is encased in a Shadowbox frame with hand-made paper flowers that surround the drawing. A little paper cloud with blue gray streams of 'wind' is cascading from the upper right corner. It is a very unique piece created for a very cherished friend. A drawing of two little furry friends. Gracie & Chloe. It is obvious they love one another. This work is done on a light copper Archival Paper that give the entire piece a warm glow. I am addicted to drawing nature. In particular, apples. There is so much satisfaction in making it unique and adding extravagant color and texture. This one is done with thousands of tiny circles and dots. I also love working on black paper, the color really pops off the page! I love this drawing of my little Zachary. Of course I have never placed headphones on him; however, in my mind I think this is the only way to get him to listen! In a perfect world kitties would listen... right? Flowers are among my most favorite elements of nature to draw. These two represent a special meaning. The Blue Iris conveys faith & hope; while the White Rose brings the essence of love to this composition. A little kitty that lives with my friend. I just imagined how he would look peering through a little mouse entrance!! It is done on black Archival Paper with the highest quality colored pencils. The sad look on this dogs face, illustrates the intensity about him. This is how I feel sometimes. This artwork was done on a light charcoal Archival Paper. A gift from a treasured friend turns into a subject for me to draw. 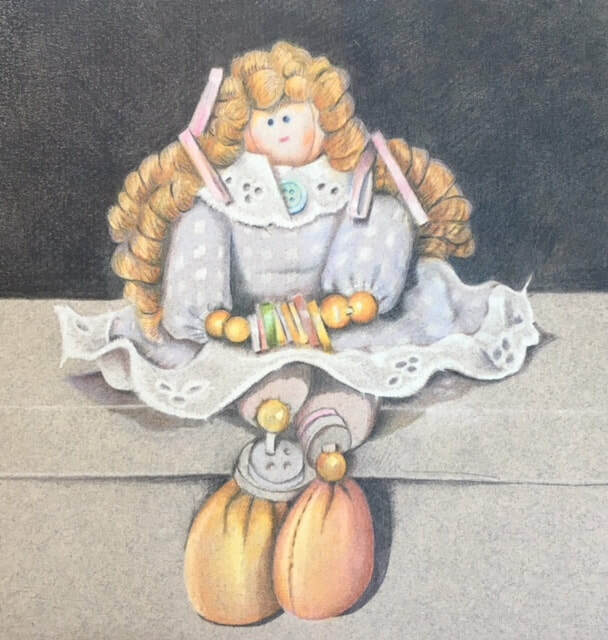 I have incorporated her into many projects and still have the gift of this doll sitting on my bookshelf. 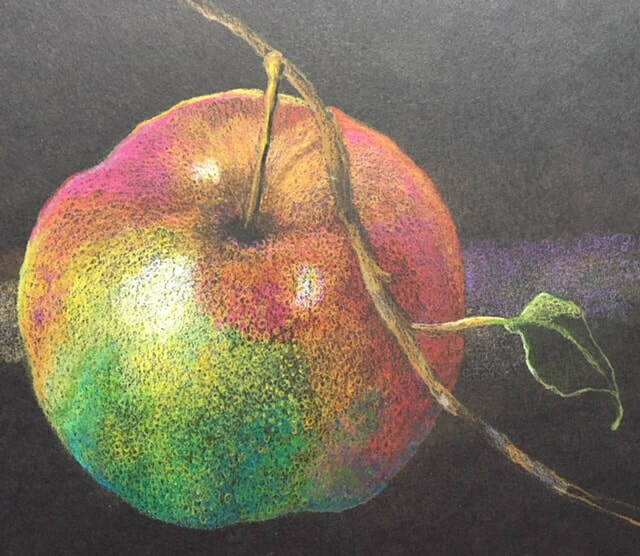 ​This artwork is an example of what can be achieved by using a variety of coloring techniques. We currently have a a number of Coloring Designs available in an OVERSIZE format, making them easier to color and design with your own scheme. We have instructions available at the Studio to go along with all of our coloring designs.